Data Rates continue to march upward and many of the limitations of Wi-Fi as we knew it (legacy 802.11a/b/g) have been overcome with features introduced with 802.11n and now 802.11ac Wave 1 & Wave 2 products. 802.11ac Wave 2 Access Points (AP) have been shipping for months and we await the mass shipment of Wave 2 enabled client chipsets. New features introduced in Wave 2 have promise to squeeze more capacity from existing RF, but capacity today is truly limited by legacy radio functionality (it’s a half-duplex media). Even with a theoretical capacity of 1.3+ Gigabit-per-second, adding clients beyond the first has a logarithmic reduction in available throughput due to contention and the one-way nature of today’s radio limitations. A new feature introduced with much fanfare is the support for Multiuser MIMO, or MU-MIMO, which allows an AP to transmit to multiple clients simultaneously. This sounds great, but let’s discuss how this is achieved and the limitations. In 802.11n, the concept of multiple “Spatial Streams” or "Spatial Multiplexing" was introduced. This allowed a radio to be equipped with multiple antenna, on the same frequency and allowed the simultaneous transmission of multiple “streams” of data to be sent to a client. Those streams were combined on a client equipped in the same manner. This allowed multiple 150 Mbps streams to be combined into up to a 450Mbps connection. The standard actually allowed more than 3 streams, however most hardware manufacturers only developed 3 stream capable chipsets. Also single-stream (and dual-stream) devices existed, with the connection limited by the lesser-capable endpoint (client or AP). Most low-end devices such as tablets and smartphones never were equipped with multi-stream radios, so they are limited to 802.11n single-stream maximum data rates of 150Mbps. Now, we have standardized beamforming in 802.11ac Wave 1+ products, which allows an AP equipped with sophisticated antenna systems and signal processing to focus energy “towards” a client. Single-User beamforming was introduced in 802.11n and was enhanced to create standards based versions of single and multi-user beamforming in Wave 2. This reduces interference for client devices and provides higher data rates via cleaner signal for the beamformed connections. Multi-User beamforming (more here: http://chimera.labs.oreilly.com/books/1234000001739/ch04.html#section-beamforming-ndp) enables the most promising of 802.11ac Wave 2 features we alluded to in this introduction of MU-MIMO! MU-MIMO allows an AP to send simultaneous streams to multiple clients. This is achieved utilizing the MU-beamforming and we’re seeing chipsets enabled for 3-4 simultaneous MU-MIMO clients beginning to ship. The increase in capacity only applies to downstream traffic to a MU-MIMO capable client and provides some relief to contention and multiplies the number of simultaneous supported clients and reduces latency for downstream data. As of 6/25, the chipsets shipping are still only MU-MIMO enabled on the AP side. I am not aware of a MU-MIMO equipped client device shipping with production MU-MIMO drivers (some chipsets are but a firmware or driver update away from support). 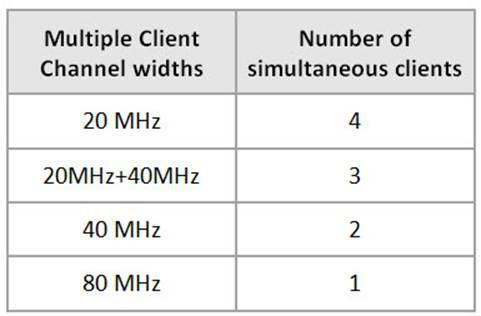 The use of wider channels (other than legacy 20Mhz) reduces the available MU-MIMO client count per AP significantly. Now that you have all of this knowledge, you’re probably thinking that MU-MIMO doesn’t hold any promise for most enterprise environments. Well lets summarize where it has the most impact. Wave 2 environments with a chosen deployment model of 20-Mhz channels and a majority of clients with SS (Single-Stream) capable devices. So where are those environments? Think large public venues, auditoriums, stadiums, training centers, airports, transportation hubs, etc. Oh, and don’t forget the device’s being deployed as part of the IoT. These will be low-powered, single-stream devices in large numbers, so again, almost EVERY environment will benefit. Wave 2 and MU-MIMO has multiple benefits, in reducing the contention, and increasing throughput (thus freeing airtime). Every Healthcare, Educational and Enterprise customer has high-density areas, and IoT deployments (sensors, environmental, etc. ), which will only increase device counts for every WLAN environment. I was lucky enough to catch some of this chatter in 2012 when these Stanford students submitted a thesis on how “noise-cancelling” technologies, such as those used in high-end headphones, could be used to overcome the half-duplex limitations of radio transmissions. Essentially once a radio begins transmitting, it’s signal is billions of times stronger than surrounding signals and overwhelms its own receiver. 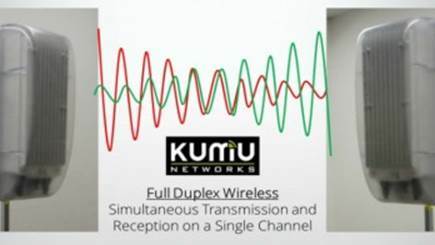 Using a variety of methods, and with far-reaching applications beyond WLAN or cellular (such as Cable / DOCSIS), KUMU has add-on technology that can be added to existing products. May all of your transmissions succeed on the first attempt.